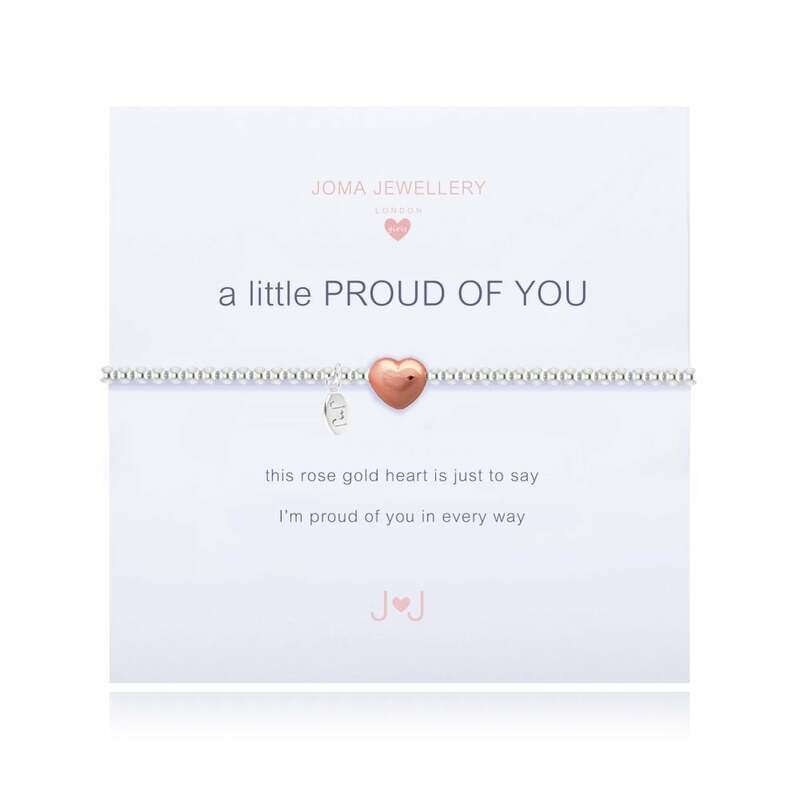 The best way to tell your little one how proud you are of them.Silver plated 3 times.Made with real crystals, stones or pearls.This Joma Jewellery bracelet is presented on a gift card that reads 'This rose gold heart is just to say I'm proud of you in every way'. Show exactly how proud you are with this beautiful A Little Proud of You children's bracelet from Joma Jewellery. This bracelet's gorgeous rose gold heart adorned between the shimmering silver beads will express your pride with a loving touch.Please keep your item dry at all times and away from perfume and body creams in order to preserve any plating and to ensure your piece lives a long and beautiful life.Each piece of Joma Jewellery comes in a gorgeous Joma gift bag with a gift tag for you to write the recipients name for easy peasy gift giving.MADE FROM: All Joma Jewellery is silver plated 3 times, strung with elasticated silk and made with real crystals, stones or pearls.DIMENSIONS: Elasticated. 15.5cm.